*This post is sponsored by Hobby Lobby. Hello friends, welcome to part 2 of my 2018 Christmas Tour! 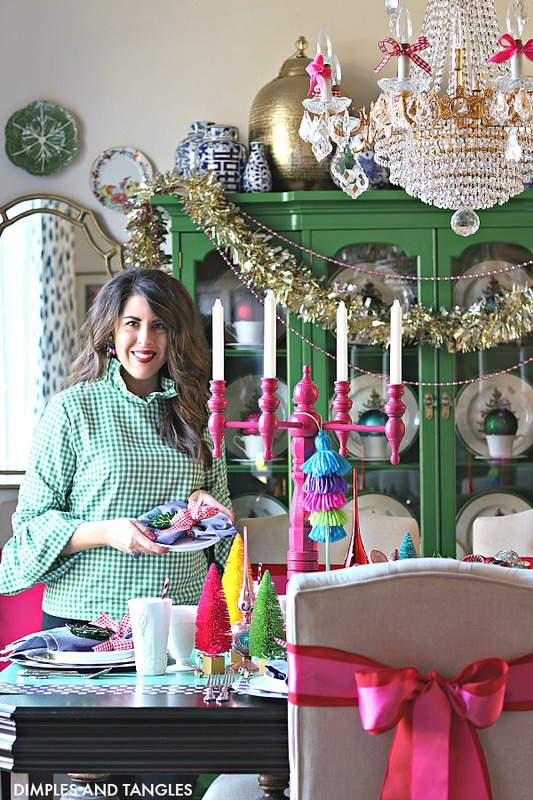 Today I'm delighted to be sharing my Dining Room and a few Christmas touches in the Kitchen. 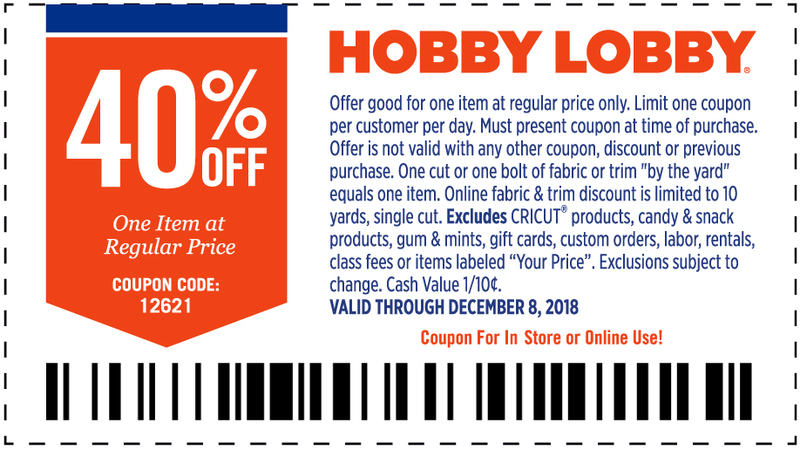 Since I'm sure I single-handedly help keep them in business, especially at Christmas, I'm so happy to partner with Hobby Lobby for this post. 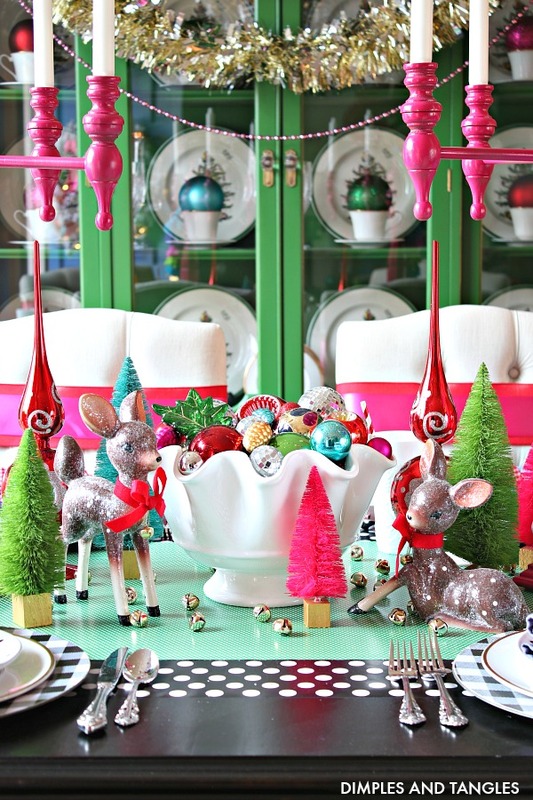 This year, my whole tablescape was inspired by this darling pair of deer and the colorful bottle brush trees. I mean, look at these cuties! They have such a vintage vibe and I can't get enough of their sweetness. 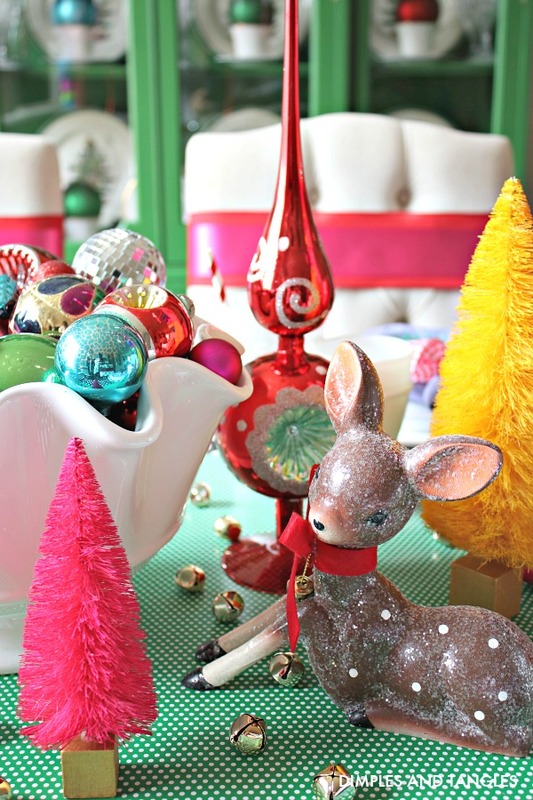 The colored glass tree topper replicas (last year's seasonal line) also remind me of vintage Christmas decor. 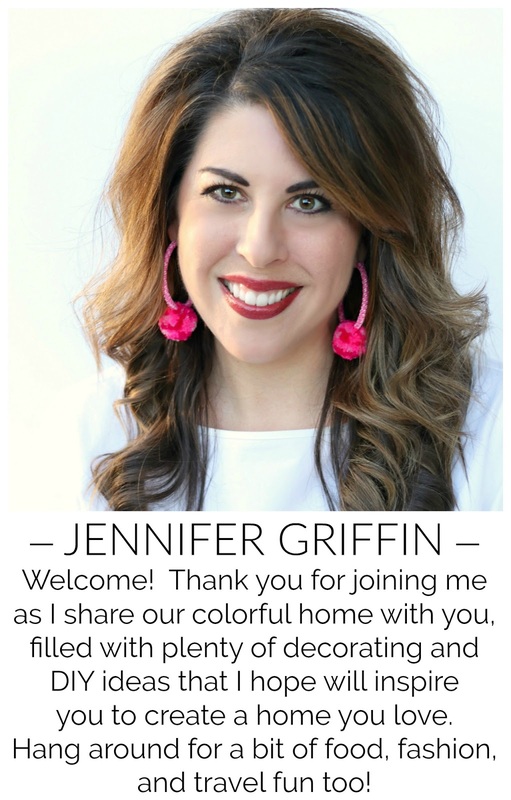 There are some similar solid colored ones this year if you want to get the look (click here for links to several products I used in today's post). 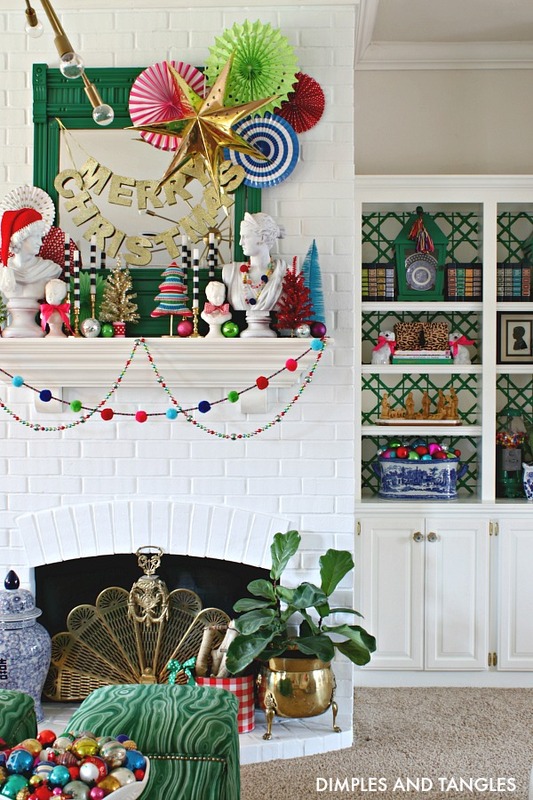 I've also always loved this tinsel garland, and this was the perfect opportunity to use a string of it to continue the vintage theme. 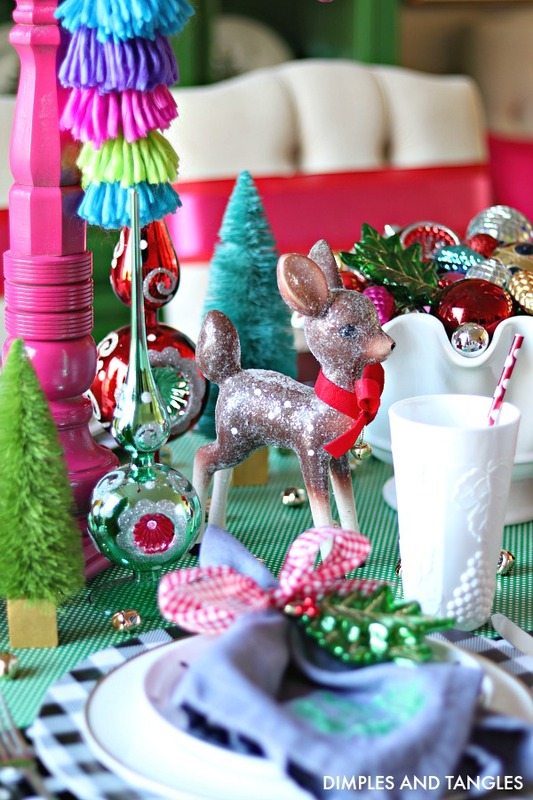 Every time I see garland like this it has such a fun retro party feel! 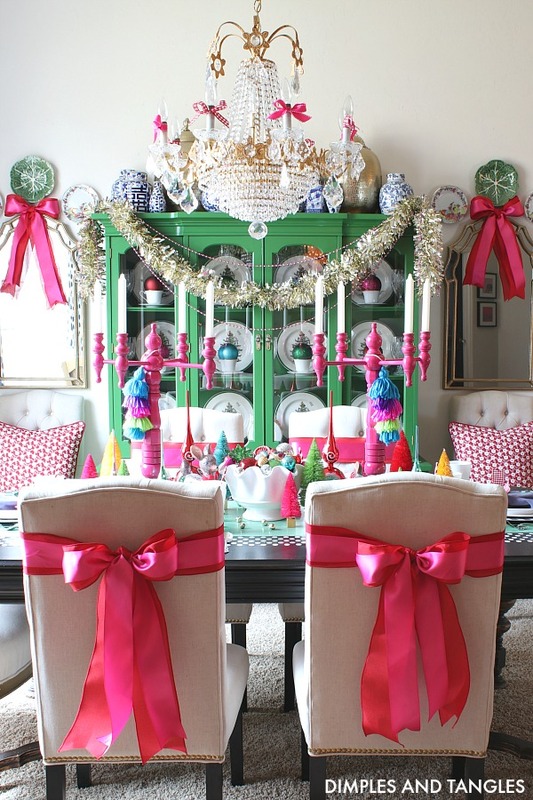 I hung a string of pink bead garland on each side as well. (I have two small hidden nails in each top corner of my China Cabinet so I can hang garlands, birthday banners, balloons, etc.) 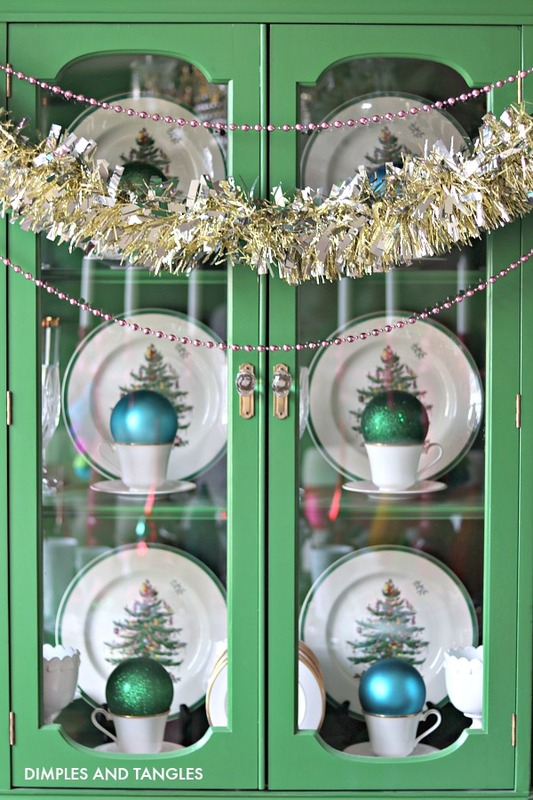 Medium sized ornaments resting in my China cups add some Christmas spirit and bring more color to the cabinet interior. 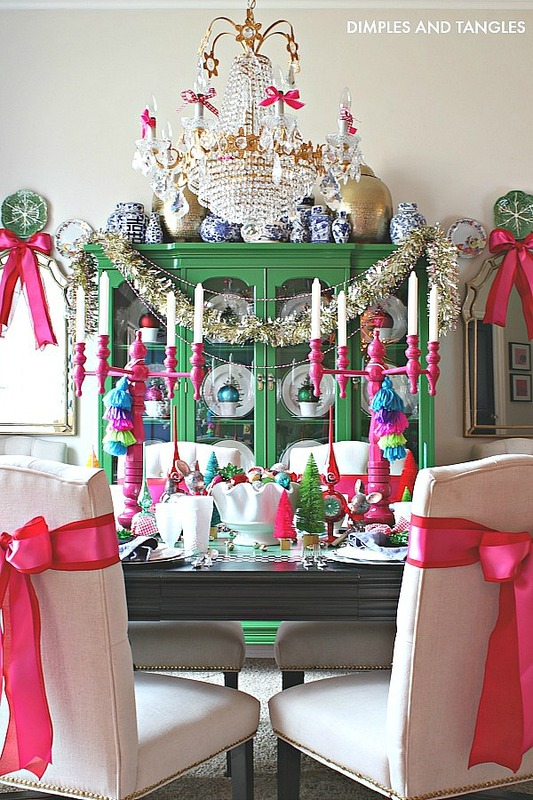 I made the candelabras several years ago following this tutorial (I altered a piece here and there and cut the arms shorter on mine- most of the pieces are from HL) and they work well on a table because they're tall enough not to be an obstruction when your guests are seated. And I'll take any opportunity I can to add a tassel to something! These gingham chargers were part of the Fall collection at Hobby Lobby, but you know I'll mix and match them all year long! I absolutely love the holly ornaments (they're shatterproof but look like glass) and tied them on as a napkin ring. They could even be a cute party favor for each guest to take home with them. 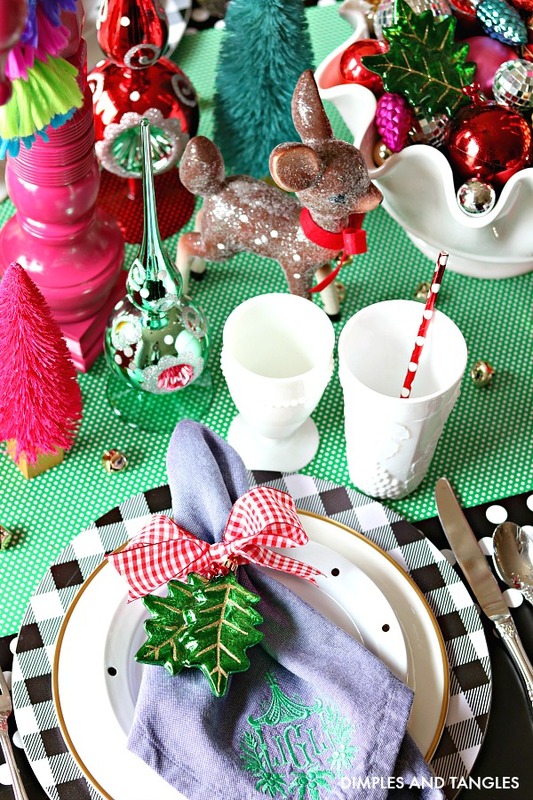 I've shared this tip a time or two before, but I love using wrapping paper as a table runner for an extra festive table. There are so many options available you can match just about any tableware you have. 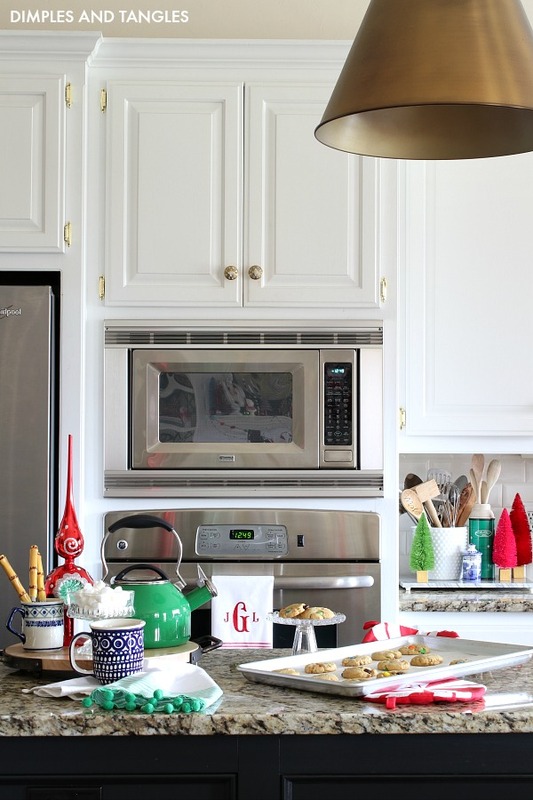 It adds another layer of color and pattern and makes for a super simple clean up job! I thought about sprinkling on some Christmas shaped confetti or fake snow, but then saw a container of small jingle bells instead and thought they would be fun scattered down the runner. 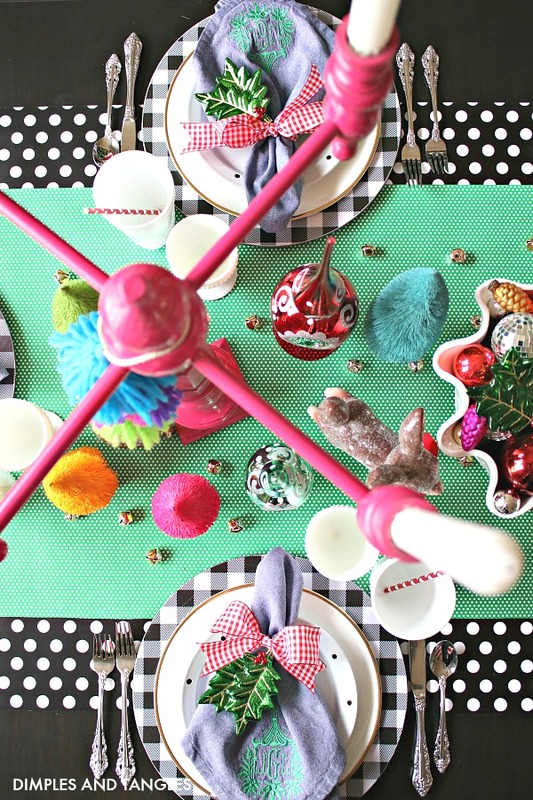 I enjoy using an alternative to flowers for my centerpieces, especially at Christmas when my table will stay set like this for a while as part of the decorations. It's nice not to worry about having to replace a centerpiece that doesn't last through the season. 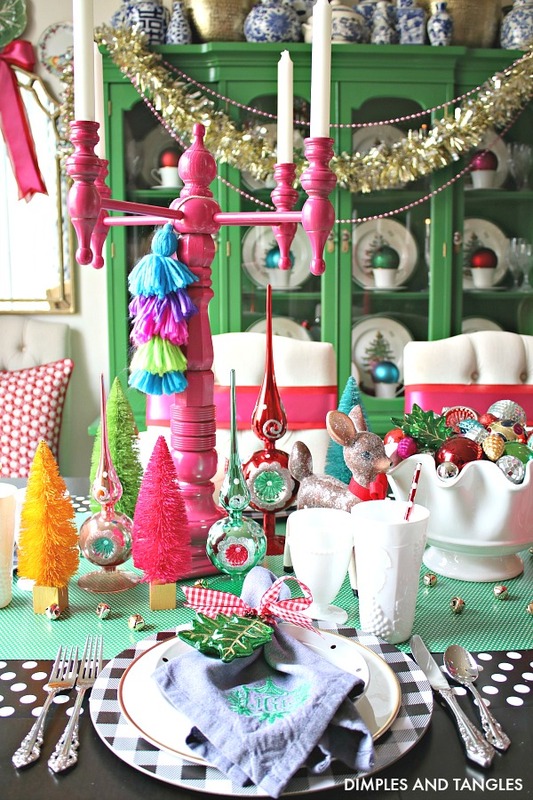 Groupings of ornaments are one of my go-to holiday decorations, and they're perfect for a centerpiece... low, interesting, colorful, and non-perishable. 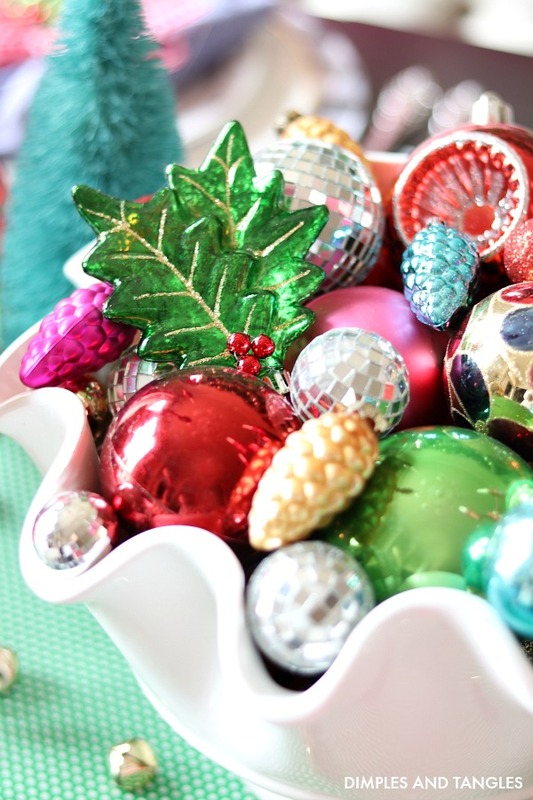 When using large bowls, I fill the bottom with leftover plain ornaments to take up most of the space, then layer the pretty ones across the top. Hobby Lobby is my go-to ribbon source. Not only does the fabric department have a vast selection of colors, materials, sizes, and patterns, but the floral section also has some great options, and the wedding aisle has some beautiful satins in a large assortment of colors and widths. And don't we all love the weeks when the ribbon is half off?!? 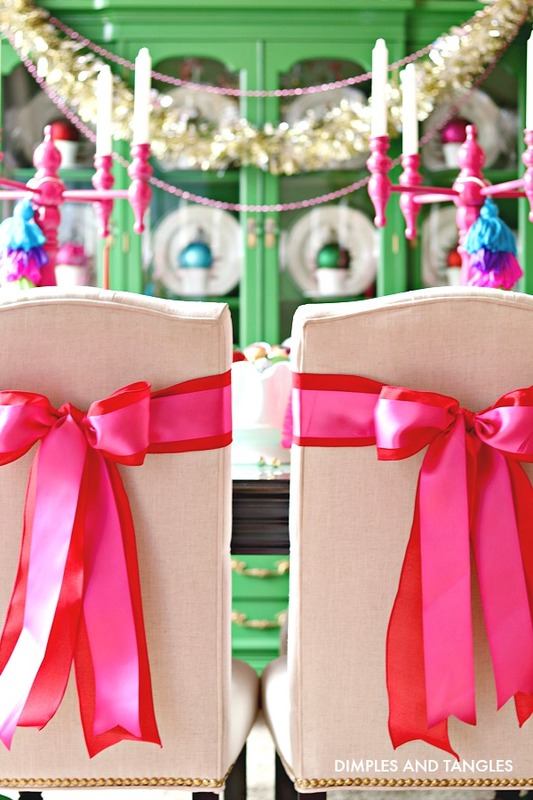 *Ribbon Storage tip: I use a LOT of ribbon for bows at Christmas. When packing things away, I take my cut length of ribbon, roll it up into a small bundle, and pin it together with a small label stating where it was used. ("Pantry Doors", "Apothecary Jars", "Dining Room Chandelier", "Dining Chairs", etc.) Then, next year I'll just unroll and they're already cut the right length and ready to be tied back on where they go. *Bonus Ribbon Tip: I used to pull out my iron if my stored ribbon had a few wrinkles in it, but for the past several years I've been using my flat iron instead! Just hold one end of the ribbon and pull it through your hot closed iron, so quick and easy and works like a charm! 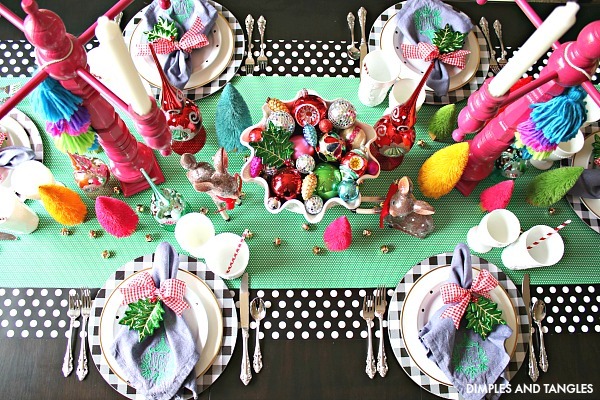 In the kitchen, I always love to add some new seasonal linens from Hobby Lobby. 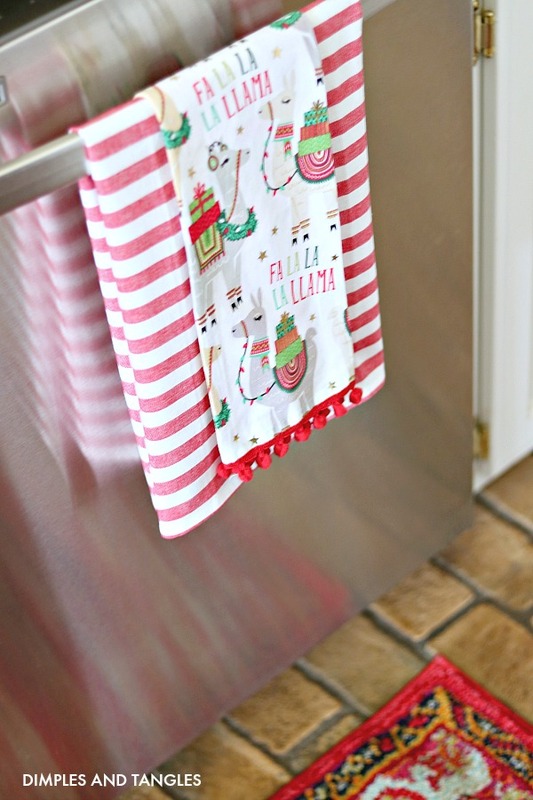 The striped tea towels with pom pom trim are a favorite set- I added a monogram to one here on my oven handle. I also picked up come cute new peppermint striped round hot pads, there never seems to be enough of those around! A few more layered tea towels, how could I resist that adorable llama towel? I also picked up a new apron and you know it was just begging for a monogram too... wouldn't these be the cutest hostess gifts? 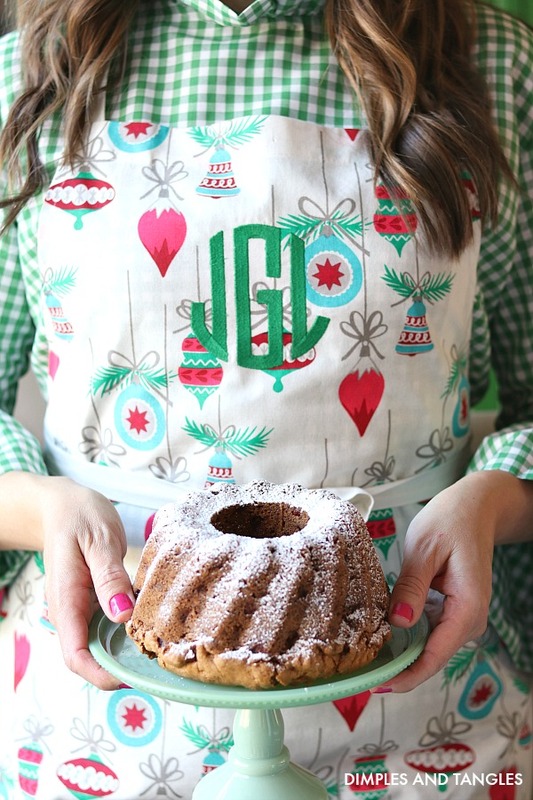 I just remembered that HL has some iron on monogram letters if you want a quick and easy project, those would be perfect to add to one of these aprons. 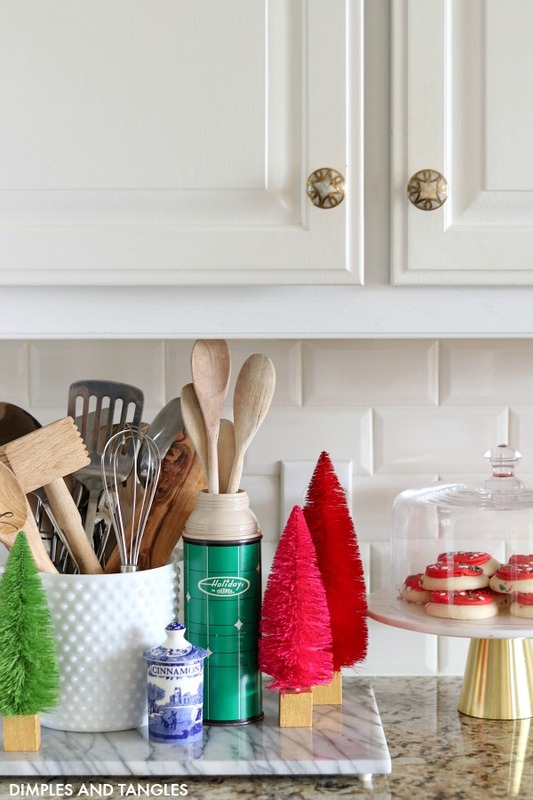 These bottle brush trees were just so good this year, they were such a great price (about $1-$3 each when on sale) and are just right for scattering all over the house. Spending so much time in the kitchen throughout the day and after washing dishes, especially in the winter, I'm always in need of some hand lotion. 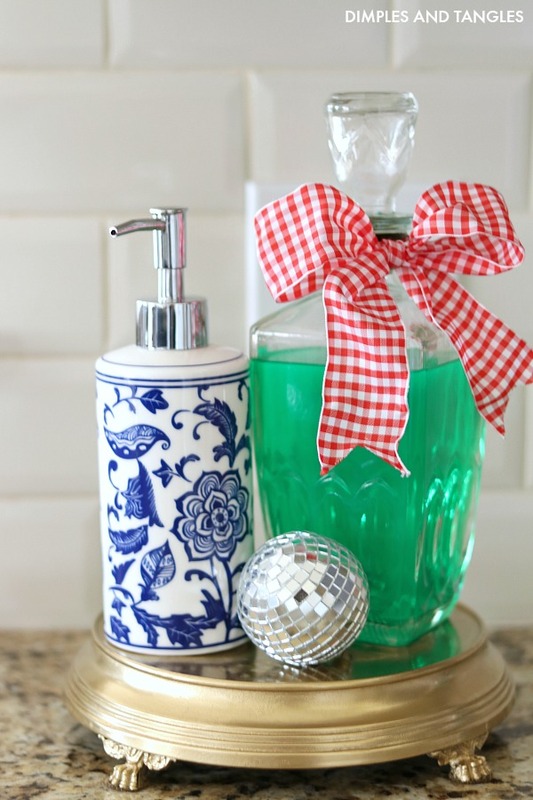 I always tuck the ugly bottle away somewhere in the kitchen but that's not very convenient, so when I saw this blue and white pump at Hobby Lobby I thought it would be perfect to fill with lotion and leave beside the kitchen sink. Pretty and practical, a winning combination! You all know I love the striped tapers from HL, but this trio of Christmas candles is really good too. 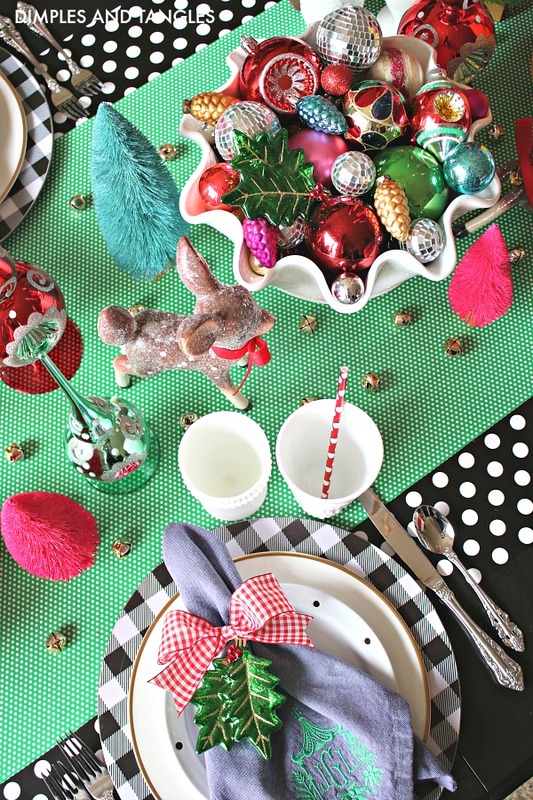 I got a couple of sets and the polka dots will be fun to use for other holiday celebrations too. 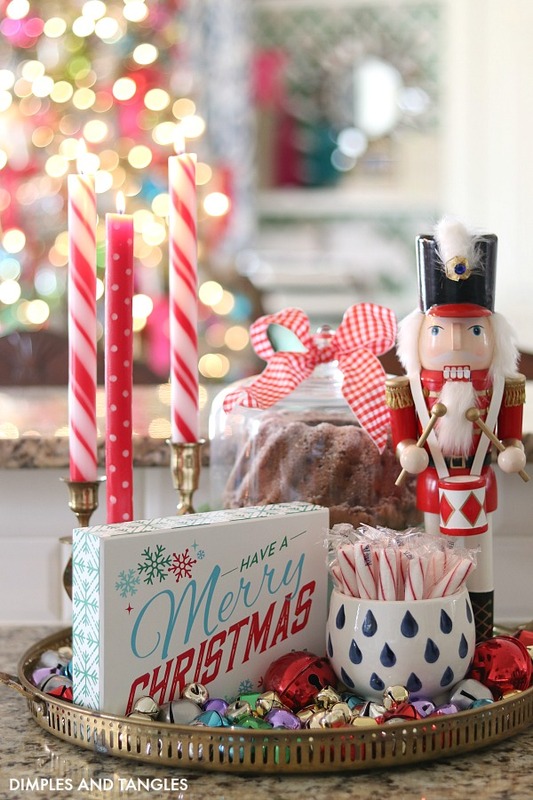 My kids absolutely love the soft peppermint sticks and that spotted dish they're in? It's got little legs on the bottom that are the cutest detail and I'm sure I'll have a small plant inside soon when the treats are gone! 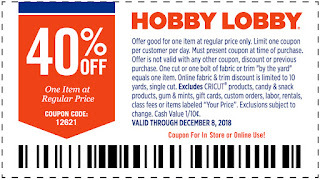 If you've seen some things in my home that you'd like to check out on your next trip to Hobby Lobby (many of the items I used are linked here), don't forget to use your coupon! And did you know that Hobby Lobby has an app so that you can always quickly access a coupon on your phone? It's a life saver (I even made my kids download it on their phones)! I hope you enjoyed this portion of my Christmas tour and were inspired with some new ideas from a few of my decorations! If you missed my Living Room on Part 1 of the tour, you can catch up on that here. I'll be sharing the final portion of this year's tour on Friday, see you then! I LOVE IT! lol we have so much of the same décor from Hobby Lobby! So many wonderful things to choose from! Thanks Ellen, enjoy your day! You know you're a friend of mine, Jen, when out shopping about and I come across some black/white check, polka dot whatever and think of you.... =) As always, love your colorful decorating style!! BTW did you paint your dining room table black? Did I miss seeing that done? Thanks Julie! No, it's just a very dark stain. I'm actually wanting to refinish it lighter... maybe a project for the Spring! Just showed the photo of your newly painted fireplace to my hubby. Our fireplace is now on the to-do list. Thank you! Thank you! Oooooh! It's a big decision since our brick wasn't terrible but I'm SO happy with it! 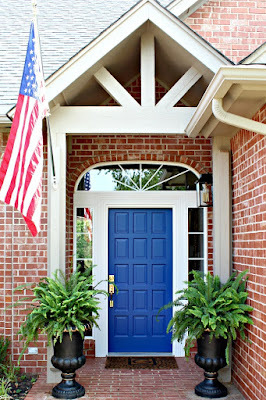 If our brick had been an ugly color I would have done it a long time ago! I love your home! Your posts inspire joy. One of my favorite blogs!